Montezuma’s revenge – Aztec Two Step – whatever nicknames it may be called, if you’ve experienced it, you know exactly what I’m talking about. Traveler’s diarrhea is the most common medical issue that people complain of while traveling in less developed countries. One of parasitic causes of travelers diarrhea is amebiasis, caused by the protozoan parasite, Entamoeba histolytica. According to the Centers for Disease Control and Prevention (CDC), Entamoeba histolytica is well recognized as a pathogenic ameba, associated with intestinal and extraintestinal infections. In this latest installment of the Parasites 101 series on the podcast, Parasitology teacher and author of Parasites: Tales of Humanity’s Most Unwelcome Guests, Rosemary Drisdelle joined me to discuss amebiasis. 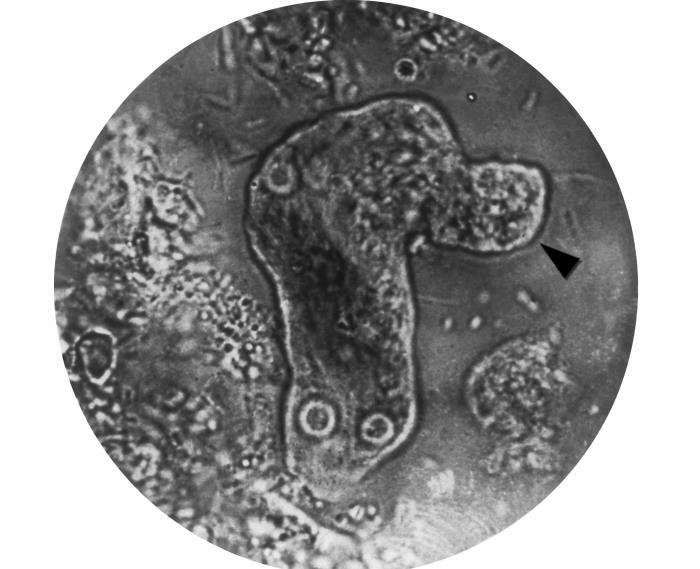 This photomicrograph of a living Entamoeba histolytica parasitic trophozoite reveals the method by which this organism moves.